Have you gone through all your leftover turkey yet? I have a few servings left of mine but I couldn’t stand to eat another bite of turkey for the 6th day in a row. There’s still tomorrow, after all. Tonight I wanted something–anything–besides turkey. Polenta has been on my mind lately. I’ve been craving it, but ironically, I haven’t always been a fan of it; I thought it too plain. Having a preference for firm polenta, I decided to add it to a salad for a lighter–but no less filling–dinner. Simply by preparing polenta on the stove, waiting for it to set then broiling the slices you can have crisp “fries” without making too much effort. I used this recipe as a base, adding cheese and herbs but used a combination of stock and water to add a bit more flavor to the corn meal as it cooked. I omitted the salt completely–it didn’t need it with the stock and cheese–and the “fries” turned out as crisp and flavorful as they look in these pictures (nice and creamy inside). The cheese flavor is subtle here but the stock and herbs added a lot to keep the polenta from being bland. I went a step further by cutting the “fries” into squares just to make them more suitable for pairing with my spinach salad. The polenta croutons went very well with the greens, feta cheese, crispy prosciutto and the slightly sweet cranberry vinaigrette from my previous post. 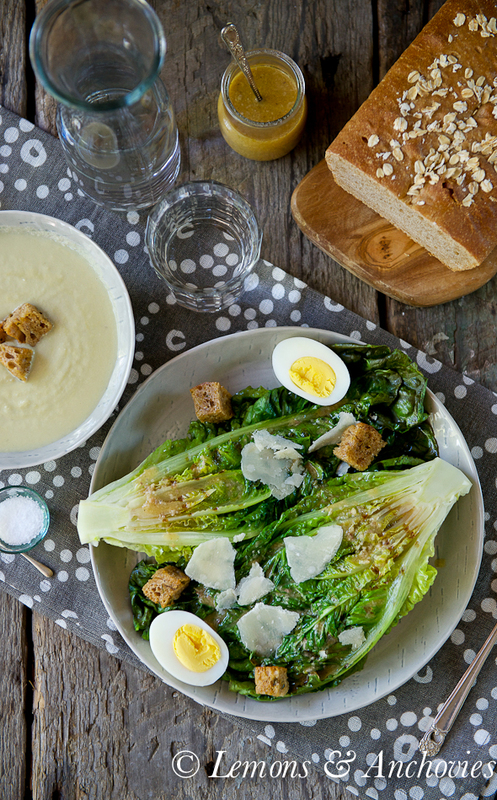 Feel free to toss the croutons with any combination of greens, cheese, meat and dressing you like–you can’t go wrong at all. As for me? I’ve already decided that this will be lunch tomorrow–I can’t wait. Broil polenta cooked with cheese and herbs and you've got crisp, healthy "fries" that can be easily turned into croutons. To prepare the polenta: Place a piece of parchment paper on an 8x8-inch square baking pan and brush with olive oil including the sides. Combine the polenta, stock, water, sage and herbs in a medium saucepan and bring to a boil over medium heat. Once it boils, reduce the heat to medium-low and cook, stirring constantly with a wooden spoon, until the polenta starts to separate from the sides of the pan, about 10-15 minutes. Stir in the butter and cheese and cook for another minute until the butter and cheese have melted and been incorporated into the polenta. Transfer the cooked polenta to the prepared baking pan; flatten and smooth the top with a rubber spatula. Allow to cool and set; this will take about 30 minutes. 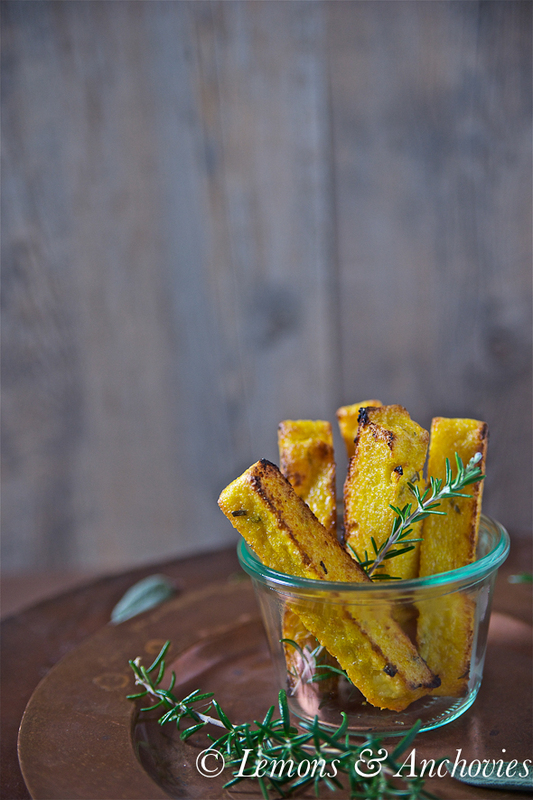 To prepare the polenta "fries": Unmold the polenta onto a cutting board. Slice into 4x1-inch pieces. 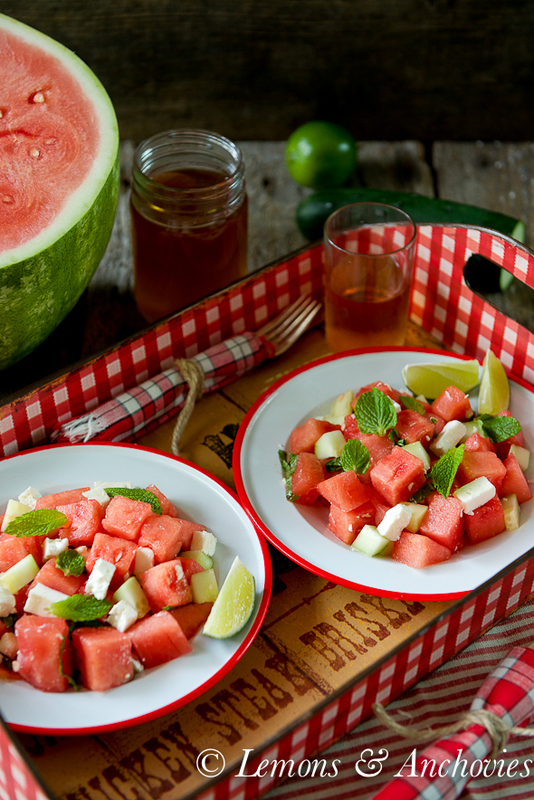 Brush the tops with olive oil and broil all sides. Each side will take 3-4 minutes to get crisp and golden. To turn the "fries" into croutons: Cool the "fries" for a couple of minutes before cutting into squares with a sharp knife. If you cut them right out of the broiler, the polenta won't be as easy to cut in clean cubes. 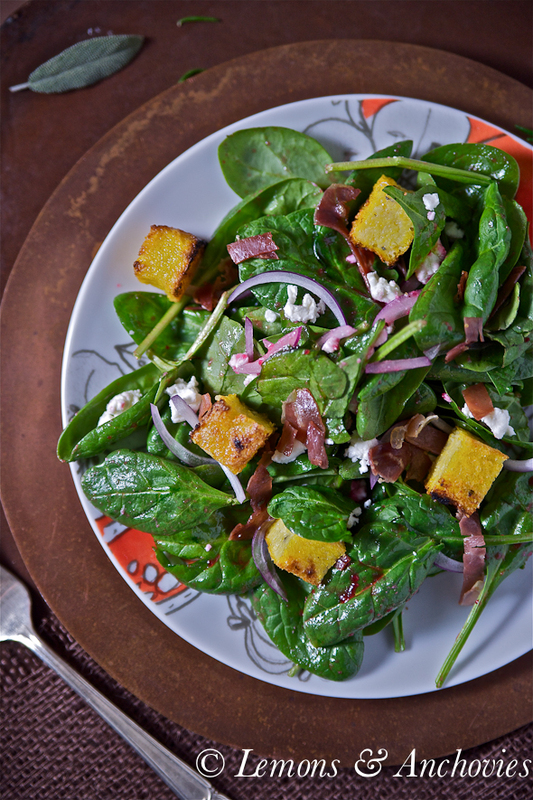 To assemble the salad: Arrange the spinach, feta cheese, onions, prosciutto and croutons on a plate. Drizzle with your favorite dressing. I don’t know what I like more – the polenta fries or the salad! 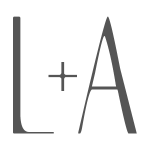 Either way, I feel like we get two recipes in one post, yay! 🙂 I had a bowl of creamy polenta in Florence that was absolute heaven, but now I’m craving your fries! Those polenta fries are magical! 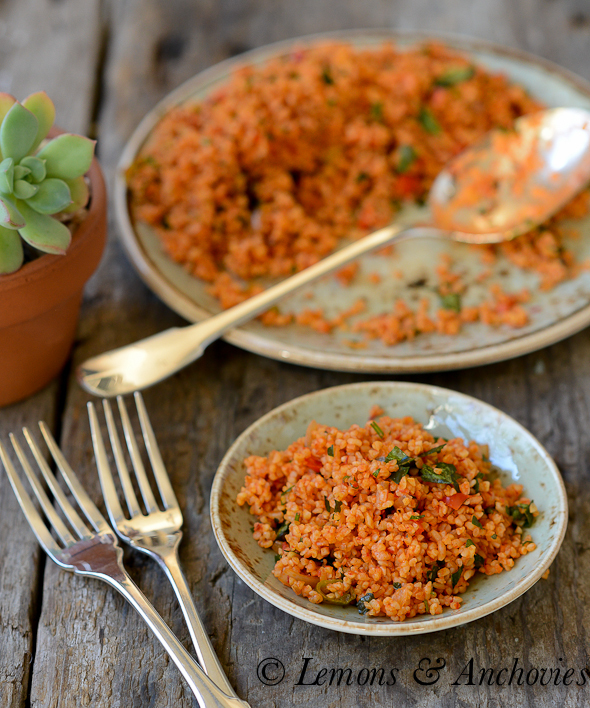 I had some when I was at Cindy’s Backstreet Kitchen and NOW I have a recipe! I bet it was hard to eat just one. 🙂 Lovely!!! I always order polenta fries when I see them on a menu..love them 😉 Your salad with polenta fry croutons is a fab idea!! I’m over the turkey, big time and ready to eat salad for dinner tonight!!!! I would looooove to have a basket of these “fries”! YUMMO! The polenta croutons sound amazing! Need to try this idea ASAP! After the heaviness of Thanksgiving (still felt! ), this salad looks fresh and light. I especially love the polenta fries and croutons! Brilliant!! I love polenta and all the ways you can make it… these sound fantastic and your photos are mouthwateringly beautiful! I haven’t had polenta in ages. Neither Tiffany or hubby likes it and I find it hard just to make a little for me. Yes, it’s best served with sauteed mushrooms and cheese, I could not ask for anything else. I can eat polenta but I’ve never ever said the words, “I can’t wait to try this” when talking about it. Not until I had a look at our dish. It definitely doesn’t look bland – it looks downright delicious. I made polenta fries once, but they were a mess. I need to try again, because we really like polenta here. Your idea of using them for croutons sounds awesome! I make polenta in various forms quite often but I have never made it into chips. Great idea! 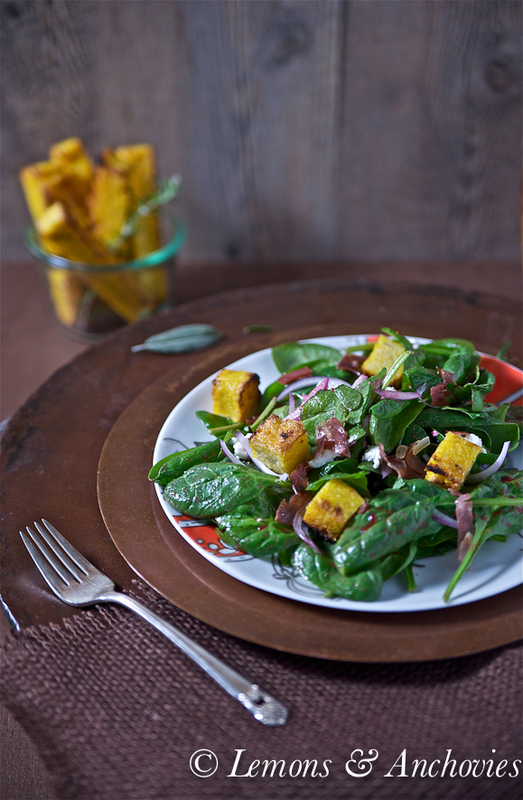 This looks so fresh and wonderful, what a great idea to use the polenta to make croutons! I love polenta fries, and I’m smacking myself on the forehead for not even thinking they would make fabulous croutons! Excellent idea! What an awesome idea! I absolutely need to try this on my salads!